IN A major development in the search for MH370, Angus Houston has confirmed the Ocean Shield has detected signals consistent with aircraft black boxes, describing the lead as the most promising yet. Air Chief Marshal Houston called the development significant, saying “this is the most promising lead, probably in the search so far, it’s probably the best information we’ve had”. The search coordinator told reporters more signals have been detected by a towed pinger locator deployed by the Australian vessel Ocean Shield. “Today, I can report some very encouraging information which has unfolded over the last 24 hours,” he told reporters in Perth. “Two separate signal detections have occurred within the northern part of the defined search area.” The first was held for more than two hours, the second for about 13 minutes. He said both would be consistent with transmissions from the flight data recorder and the cockpit voice recorder. Air Chief Marshal Houston described the find as “the most promising lead” yet. “We haven’t found the aircraft yet,” he stressed, arguing further confirmation is needed. Air Chief Marshal Houston said the position of the signals would need to be fixed before an autonomous underwater vehicle ‘Blue Fin 21’ could be deployed to locate wreckage. He further argued it could take time to establish with certainty if the detections are from MH370. “You’re right, the life of the batteries must be getting somewhere close to the end of life,” he admitted, when asked about the black box. “We’re already one day past the advertised shelf life. We hope that it keeps going for a little bit longer,” he said. 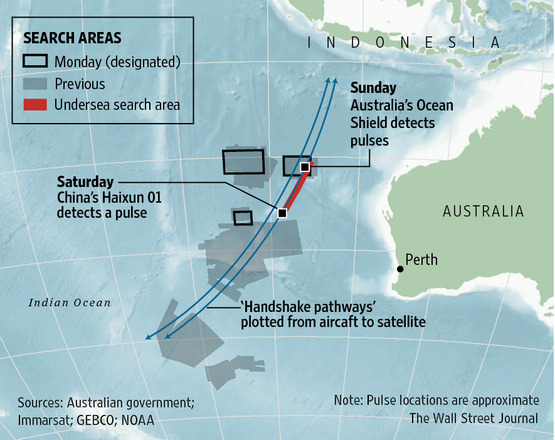 PERTH, Australia—Around 9 a.m. on April 4, the MV Ocean Shield dropped its underwater black box detector where experts thought Malaysia Airlines 3786.KU +2.44% Flight 370 had gone into the sea—a thin strip of ocean off the remote northwestern coast of Australia. Less than 48 hours later, against the odds, the ship had picked up a continual stream of high-frequency pings. Each pulse arrived a second apart, like a human heartbeat. As ships search for the flight recorders from Malaysia Airlines Flight 370 in the southern Indian Ocean, Malaysian Defense Minister Hishammuddin Hussein said Monday that his country isn’t ready to declare the plane lost. Mr. Hishammuddin, who is also acting minister of transport, told a news conference that Malaysia will consult with all investigating agencies and foreign governments on when to declare the Boeing 777-200 lost with no survivors so relatives can start accessing the bank accounts of the missing passengers and crew and begin to submit insurance claims. Malaysian officials have insisted that they don’t view the plane as lost, though on March 24, Prime Minister Najib Razak said the flight “ended” in the Indian Ocean. A multinational team is now searching there for the plane and its data recorders. Mr. Najib stopped short of saying the aircraft crashed, though he noted there were no nearby places to land. The Australian navy over the weekend picked up extended signals from deep underwater that may have come from Malaysia Airlines Flight 370’s two “black box” flight recorders. Retired Air Chief Marshal Angus Houston, who is leading the multinational search, said the lead appeared to be the best so far. Malaysia Airlines Chief Executive Ahmad Jauhari Yahya told The Wall Street Journal that the company is in discussion with authorities and others on the final status of Flight 370. "I have always said to the families: 'miracles do happen,'" Malaysian Defense Minister Hishammuddin Hussein told reporters at a briefing in Kuala Lampur Monday. "We continue to hope and pray for survivors," he added, according to a report in the UK newspaper, The Telegraph. "We've got a visual indication on a screen and we've also got an audible signal," Houston said, "and the audible signal sounds to me just like an emergency locator beacon." There is little time left to find the devices, which have beacons that emit "pings" so they can be more easily found. However, the beacons' batteries last only about a month. Tuesday marks exactly one month since the plane disappeared. As the search for missing Malaysia Airlines flight 370 enters its second month, an all-too-rare glimmer of good news has been found: On Sunday, an Australian navy vessel reported signals “consistent” with those emitted by an airplane’s black box in the South Indian Ocean. These aren't the only signals, or "pings," that have been heard. At first glance, the news out of Australia appears to back up reports from China, where state media reported over the weekend that a Chinese vessel had also found audio pulses. But there's a problem. The two sets of signals are 300 nautical miles apart. Experts say it is unlikely they could be coming from the same origin. What's more, Australian investigators told reporters that they did not hear about China's possible signal until it was published by Xinhua News Agency on Friday. The Sydney Morning Herald reported that same day that Australia had to ask China for more information after Xinhua's report came out. The situation appears to expose one of the practical problems of conducting a search as vast and complicated as the one for Flight 370: China's intense interest but confused status in the investigation. Up to eleven military planes, three civil planes and 14 ships will assist in today's search for missing Malaysia Airlines flight MH370. AMSA has directed the search of one large search area today of approximately 77,580 square kilometres, 2268 kilometres north west of Perth. The first flight is expected to depart at 6:00am WST. Good weather is expected for searching throughout the day. The underwater search continues today, with ADV Ocean Shield at the northern end of the defined search area, and Chinese ship Haixun 01 and HMS Echo at the southern end. On Monday, U.S. Navy Commander William Marks told CNN from the search operation that the inability of the Ocean Shield's pinger locator to find the signals again more than a day since the last reception caused initial optimism to become "more and more cautious." The Ocean Shield and its towed pinger locator continue to search the area where it detected the signals to try to hear them again. If they do, searchers would send out a Bluefin-21 Autonomous Underwater Vehicle with a more accurate sonar and possibly a camera for mapping and studying the the ocean floor, Leavy said. "At the moment that's not deployed," he told reporters. "The focus is on trying to reacquire the acoustic signal that they had" by the end of Tuesday. Meanwhile, the website MarineTraffic.com indicated Monday that three ships were searching a spot further to the south where the Haixun 01, a Chinese patrol boat, reportedly detected pulse signals on Saturday. Another Chinese vessel and the HMS Echo of Britain's Royal Navy joined the Haixun 01 in the area, according to the website, which has been reliable in reporting the movements of search vessels. Officials had said they would send additional resources to help the Haixun 01 try to find the source of pulse signals it detected on the same 37.5 kHz frequency used by airplane recorders. Search crews pursuing underwater electronic pings that could be from the missing Malaysian jetliner's black boxes plan to launch an underwater vessel into the Indian Ocean, officials said. Warren Truss, Australia's acting prime minister, said the crew on board the Australian ship Ocean Shield will launch the underwater vehicle, the Bluefin 21 autonomous sub, Tuesday. The sub can create a sonar map of the area to chart any debris on the sea floor. With almost three days passing since possible "black box" signals have been picked up, searchers for Malaysia Airlines Flight 370 face a decision over moving the search to a new phase with the deployment of an unmanned submersible to crawl the ocean floor. 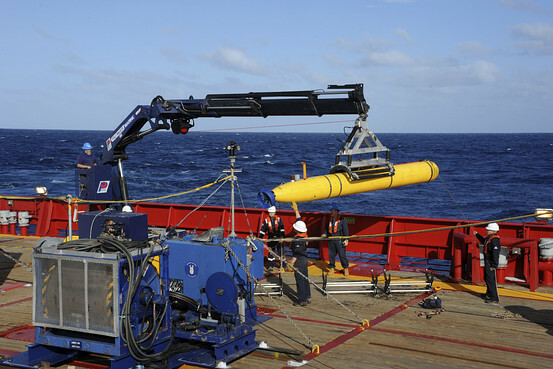 In this photo taken on April 1 provided by the U.S. Navy, the Bluefin 21, Artemis autonomous underwater vehicle is hoisted back on board the Australian Defense Vessel Ocean Shield after successful buoyancy testing in the Indian Ocean. 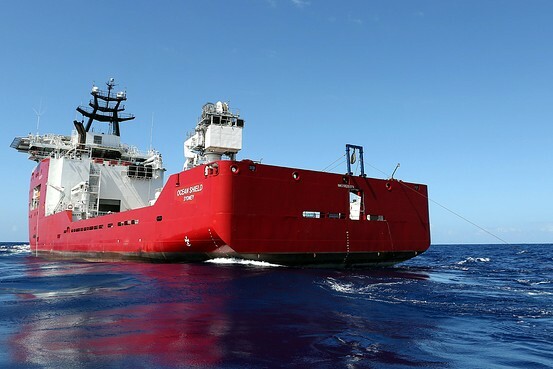 The ADV Ocean Shield continued to search for signals of Flight 370′s black boxes on Tuesday but failed to find any new leads. It is now almost three days since the ship’s crew last picked up a ping early Sunday. The likelihood grows with each passing hour that the batteries on the flight’s locator beacons have drained. The towed pinger locator, essentially an underwater microphone, will become useless at that point, and will require the search to enter a new phase with the deployment of the unmanned Bluefin-21 submersible to crawl the ocean floor. The Ocean Shield cannot use its submersible drone and its black box detecting equipment at the same time, according to the head of the search, Chief Air Marshal Angus Houston. So choosing to deploy the Bluefin-21 would mark a definitive switch in the search: effectively signaling an end to hopes that further location pings from the black boxes can be picked up. Switching to the submersible won’t be done lightly—if the site the Ocean Shield has found is the wrong one, deploying the slow-moving underwater drone too early could sacrifice chances to find the black boxes with the towed pinger locator at a different site during the last remaining hours that their batteries remain active. At the moment, other ships and submersibles have been ordered to stay away from the Ocean Shield while it conducts its searches. Even the slightest noise from another craft can confuse the black box detector it’s towing behind it, creating a false signal. But once the pinger locator’s 6,000-meter cable is finally reeled in, a swarm of support vessels and submersible search devices are likely to enter the area. If the search site can be narrowed through the triangulation of the collected underwater pings, then the Ocean Shield’s 17-foot yellow drone may be all that is needed to finally discover the wreckage of Flight 370. The Bluefin-21 can be programmed to conduct a specific search mission of around 20 hours, using side-scan sonar to scroll back and forth looking for unique features on the ocean floor. Once hauled back on board, its data is downloaded and analyzed. If operators on board the Ocean Shield discover an anomaly on the seabed, then the Bluefin-21 will have its sonar scanning equipment stripped off and replaced with a high-grade underwater camera. The submersible can only accommodate one of the two systems at a time. After another 20 hour mission, 3-4 hours of download time, and further analysis of camera imagery, the fate of the plane may be known when four experts from the Australian Transport Safety Bureau aboard the boat, and 11 onsite crew from Phoenix International Holdings Inc., the company under contract to the U.S. Navy to provide the Bluefin-21 and towed pinger locator, scrutinize camera images to identify wreckage from the missing plane. 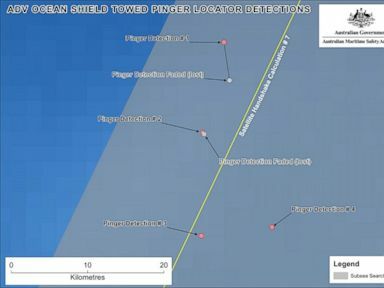 But evidence from Bluefin-21 showing a crash site could also take far longer to obtain that two 20 hour missions, depending on the size of the search area and many other factors. A U.S. Navy memo from Tuesday said that picking up more signals from the locator beacons could help improve the estimated position of the black boxes from within two miles to within “a couple of hundred yards,” limiting the number of sorties the Bluefin-21 may need to be sent out on. Up to 11 military aircraft, four civil aircraft and 14 ships will assist in today's search for missing Malaysia Airlines flight MH370. Today AMSA has planned a search area of about 75,423 square kilometres. A weak front is moving in from the south east, expected to bring scattered showers. Press conference from Australia--NOW on CNN! 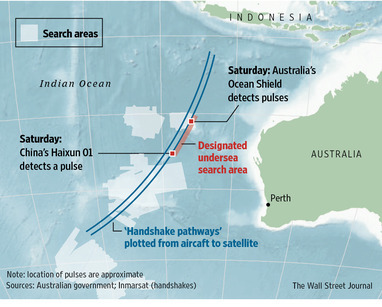 Maps released by Australia's Joint Agency Coordination Centre show the location of signals detected by a pinger locator towed by the Ocean Shield. Australia officials say new signals have been detected in the southern Indian Ocean, consistent with the pings of a plane's black box. Officials believe that the pings could be connected to missing Malaysia Airlines Flight 370, which went missing March 8 with 239 people on board. Sound-locating equipment on board the Ocean Shield reacquired the signal on two occasions, Angus Houston, the retired Australian air chief marshal who is heading the search operation far off Australia's west coast, said. Search crews detected several "pings"
The signal was held Tuesday afternoon for 5 minutes, and later Tuesday for about 7 minutes, Houston said. Those signals allow search crews to narrow the search area into a more manageable size. Wreckage still needs to be found in order for authorities to know for sure that this is the plane's final resting place, Young said, but the reacquired signals mark a new turning point in the difficult search. "I believe we are searching in the right area," he said. Authorities still have not deployed a submarine in the area. Australian searchers have relocated an underwater electronic signal that could be from the missing Malaysian jetliner in the Indian Ocean, the search coordinator says, allowing them to narrow the focus of their effort to find wreckage. Angus Houston, who is leading the joint search, said in Perth on Wednesday that equipment aboard the Australian ship Ocean Shield twice reacquired signals first detected last week that could be coming from the black box data and voice recorders on board the missing Malaysian Airlines Flight 370. He said the ship has now heard the signal a total of four times, most recently a seven-minute transmission Tuesday night. The new data has allowed searchers to further reduce the size of the search area, Houston said. "I believe we are searching in the right area'' for the wreckage, he said. On Tuesday, the ship once again reacquired the signals. That's four signals in the same broad area: two on Saturday; two on Tuesday. "I believe we are searching in the right area but we need to visually identify wreckage before we can confirm with certainty that this is the final resting place of MH370," Houston said. The second piece of good news? Authorities analyzed the signals picked up Saturday and determined they were not of natural origin and was likely sourced from specific electronic equipment. "They believe the signals to be consistent with the specification and description of a flight data recorder," Houston said. Wednesday is Day 33 in the search for Malaysia Airlines Flight 370, which went missing March 8. It was carrying 239 people. Authorities haven't given up trying. Instead, they are pinning their hopes on the so-pings. The batteries powering the flight recorders' locator beacons are certified to be working for 30 days. Stored in a plane's tail, they are designed to begin sending off distinct, high-pitched signals as soon as they come in contact with water. "The signals are getting weaker. Which means we're either moving away from the search area or the pinger batteries are dying," Houston said. The Ocean Shield, pulling the U.S. Navy towed pinger locator, acquired two more signals, retired Air Chief Marshal Angus Houston, who is heading the search operations, said today. The vessel, which previously picked up two signals, is now searching a much more concentrated area. No debris has been found, said Houston, who heads the Joint Agency Coordination Centre. “We are searching in the right area,” Houston told reporters, adding further search and visual confirmation are needed to determine the final resting place of MH370. "Hopefully in a matter of days, we will be able to find something on the bottom that might confirm that this is the last resting place of MH370," Houston said at a news conference in Perth, the starting point for the search in the southern Indian Ocean. Finding the sound again is crucial to narrowing the search area so a small submarine can be deployed to chart a potential debris field on the seafloor. If the autonomous sub was used now with the sparse data collected so far, covering all the potential places from which the pings might have come would take many days. "The better Ocean Shield can define the area, the easier it will be for the autonomous underwater vehicle to subsequently search for aircraft wreckage," Houston said. Page created in 6.279 seconds with 19 queries.